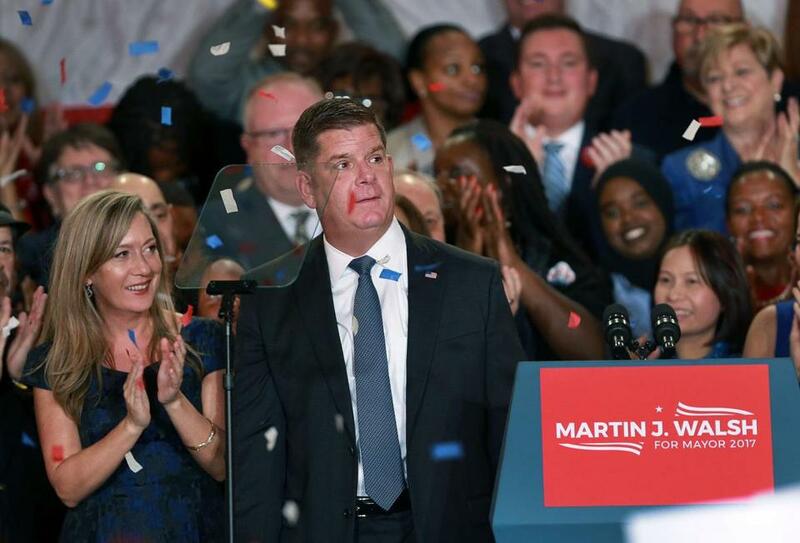 Mayor Martin Walsh, who has built a record-breaking campaign account since entering City Hall, has spent nearly $900,000 on a boutique fund-raising consulting firm that employs his longtime partner Lorrie Higgins (left). The Walsh campaign’s payments to LB Strategies are increasing, reaching $13,500 a month last year. This is evidence, Walsh aides say, of the company’s expanding role in his political world. But the payments, and the ties to Walsh’s girlfriend, Lorrie Higgins, could create questionable political optics for the second-term mayor, analysts said. Walsh’s fund-raising has flourished while he has been in City Hall, topping $2.7 million in 2017 alone, the year he successfully sought reelection, and fund-raising has brought in a total of $12.8 million since his first mayoral run, in 2013. Aside from Governor Charlie Baker, no candidate at the state or local level has raised more in Massachusetts since 2013. LB Strategies has earned $1.6 million in fees from political campaigns since early 2013, including the $900,000 from Walsh. The firm’s other clients have included House Speaker Robert A. DeLeo, the Democratic State Committee, and two statewide officeholders who brought in far less money, according to state campaign finance records. Higgins’s work for Walsh’s campaign is not a violation of campaign finance rules, and Bosio praised her hire as “one of the best decisions I’ve ever made.” But should Walsh find himself in a competitive race, whether for mayor or another office, Higgins’s growing behind-the-scenes role could invite scrutiny, even from those not intimately attuned to the inner workings of campaigns. “It’s the kind of thing that voters are concerned about. It looks like nepotism in some form,” said Maurice Cunningham, a University of Massachusetts Boston professor who has written extensively about campaign finance issues. Now, Higgins — who shares a home with Walsh in Dorchester — is involved in much of the work LB Strategies performs for the mayor, in addition to helping other clients on fund-raising events, said Costello, Walsh’s spokeswoman. Costello provided an undated e-mail from a state Ethics Commission attorney, saying that Higgins’s work for Walsh would not create potential conflict-of-interest issues because she wasn’t a public employee. A spouse can also be paid through a campaign if it’s for “reasonable and necessary expenses,” campaign finance officials have said. And Walsh isn’t the only local politician leaning on family for campaign help: Attorney General Maura Healey employs her sister, Tara Healey, as her campaign’s executive director, paying her about $4,900 a month. Walsh had tapped Bosio for fund-raising help both before and during his 2013 run for mayor, when Bosio had already established herself in Massachusetts political circles. She registered her firm in Massachusetts in 2005, according to state corporation records, and had worked for other high-ranking officials, including former state treasurer Timothy Cahill and former Senate president Robert E. Travaglini. Higgins joined LB Strategies in March 2014, two months after Walsh took office, when he reached an agreement making the firm a regular part of his campaign operations. That included paying a monthly $5,000 fee, a move Walsh’s campaign said allowed Bosio to pay recently hired staff, including Higgins, on a regular basis. Roughly a year later, that monthly fee more than doubled, and it eventually grew to $13,500 by mid-2018, some eight months after Walsh’s reelection campaign ended. In February, he paid the company $14,600, records show. DeLeo has regularly paid a $2,000 monthly fee to LB Strategies since 2017, and $1,000 a month before then, including when he raised $569,200 in 2016, a record for a House candidate. State Treasurer Deborah B. Goldberg has paid $3,000 a month since 2016, while the Massachusetts Democratic State Committee has paid Bosio’s shop installments of $4,000 or $5,000 for fund-raising help since 2015. Healey, who enlisted LB Strategies for less than a year, from 2016 to 2017, regularly paid a $4,000 fee, records show. For comparison, she has since hired Danielle McCourt of DLM Strategies at $7,000 per month to run her campaign’s finances. All told, Walsh’s campaign has paid LB Strategies $888,750 since 2013. The next two highest-paying clients during that time period were the State Committee, at $208,000, and the Committee for a Democratic House Political Action Committee at $202,000. US Representative Joseph P. Kennedy III, a Newton Democrat, has paid a relatively similar amount for fund-raising consultants as Walsh, reporting $1.07 million for those expenses since 2013 as he has raised $10.35 million. Those involve payments to as many as four or five consultants in a given two-year reporting period for a congressional election. Walsh’s campaign said its payments to Bosio’s shop are much higher than those from her other clients because its work has grown to go “above and beyond the scope” of others. It pointed to work typically done by a fund-raiser — such as organizing events and communicating with donors — but also managing Walsh’s Dorchester campaign office, where, records show, he continues to pay rent, although he has not said yet whether he will seek a third term or any other office. Walsh, who was not available for an interview, his aides said, praised Bosio in a statement, saying she and “her team have consistently surpassed expectations” since he hired her. “We set big goals and Laurie built a team that could support that work,” Walsh said. Since Walsh was elected, Higgins has largely cut a low public profile, but she’s been active in other ways. She and Walsh have cohosted his annual holiday cocktail party each of the last two Decembers in the Seaport, according to invitations reviewed by the Globe, and last summer, Higgins was helping organize Walsh’s volunteer network to turn out for the mayor’s former chief of staff, Daniel Koh, in his Third Congressional District campaign. Higgins has also hosted “Women for Walsh” campaign events for the mayor, and she’s sent out fund-raising appeals on his behalf, including last year for Walsh’s 51st birthday when she asked donors to help reach a $5,100 goal “our team set,” according to a copy of the solicitation. Before joining LB Strategies, Higgins was a longtime aide on Beacon Hill, where she built a reputation as a discreet staffer who “gets the job done.” She worked for then-representative Eugene L. O’Flaherty, who left the State House in 2014 when Walsh tapped him to be the city’s corporation counsel. “We had known each other for years, she was already familiar with all of my clients, and she had the experience to back it up,” Bosio said. Higgins was not available for an interview, according to Walsh’s campaign.